When Saad Hariri’s jet touched down in Riyadh on the evening of 3 November, the first thing he saw was a group of Saudi policemen surrounding the plane. When they came aboard, they confiscated his mobile phone and those of his bodyguards. Thus was Lebanon’s prime minister silenced. It was a dramatic moment in tune with the soap-box drama played out across Saudi Arabia this past week: the house arrest of 11 princes – including the immensely wealthy Alwaleed bin Talal – and four ministers and scores of other former government lackeys, not to mention the freezing of up to 1,700 bank accounts. Crown Prince Mohamed bin Salman’s “Night of the Long Knives” did indeed begin at night, only hours after Hariri’s arrival in Riyadh. So what on earth is the crown prince up to? Put bluntly, he is clawing down all his rivals and – so the Lebanese fear – trying to destroy the government in Beirut, force the Shia Hezbollah out of the cabinet and restart a civil war in Lebanon. It won’t work, for the Lebanese – while not as rich – are a lot smarter than the Saudis. Every political group in the country, including Hezbollah, are demanding one thing only: Hariri must come back. As for Saudi Arabia, those who said that the Arab revolution will one day reach Riyadh – not with a minority Shia rising, but with a war inside the Sunni Wahhabi royal family – are watching the events of the past week with both shock and awe. But back to Hariri. On Friday 3 November, he was in a cabinet meeting in Beirut. Then he received a call, asking him to see King Salman of Saudi Arabia. Hariri, who like his assassinated father Rafiq, holds Saudi as well as Lebanese citizenship, set off at once. You do not turn down a king, even if you saw him a few days’ earlier, as Hariri had. And especially when the kingdom owes Hariri’s “Oger” company as much as $9bn, for such is the commonly rumoured state of affairs in what we now call “cash-strapped Saudi Arabia”. But more extraordinary matters were to come. 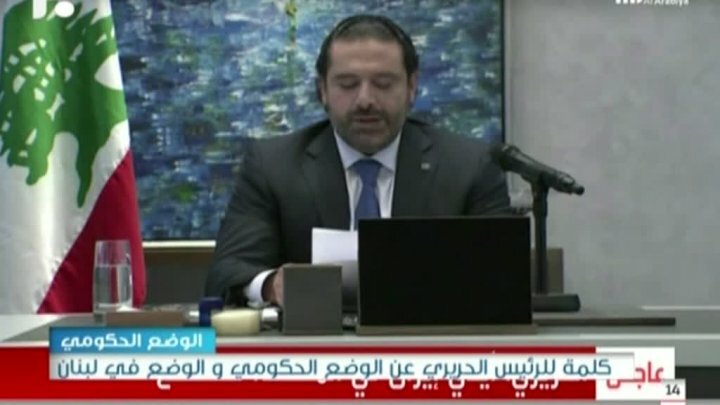 Out of the blue and to the total shock of Lebanese ministers, Hariri, reading from a written text, announced on Saturday on the Arabia television channel – readers can guess which Gulf kingdom owns it – that he was resigning as prime minister of Lebanon. There were threats against his life, he said – though this was news to the security services in Beirut – and Hezbollah should be disarmed and wherever Iran interfered in the Middle East, there was chaos. Quite apart from the fact that Hezbollah cannot be disarmed without another civil war – is the Lebanese army supposed to attack them when Shia are the largest minority in the country (many of them in the army)? These were not words that Hariri had ever used before. They were not, in other words, written by him. As one who knows him well said this week, “this was not him speaking”. In other words, the Saudis had ordered the prime minister of Lebanon to resign and to read his own departure out loud from Riyadh. I should add, of course, that Hariri’s wife and family are in Riyadh, so even if he did return to Beirut, there would be hostages left behind. Thus after a week of this outrageous political farce, there is even talk in Beirut of asking Saad Hariri’s elder brother Bahaa to take his seat in the cabinet. But what of Saad himself? Callers have reached him at his Riyadh home, but he speaks only a few words. “He says ‘I will come back’ or ‘I’m fine’, that’s all, only those words, which is very unlike him,” says one who must know. And what if Hariri did come back? Would he claim that his resignation had been forced upon him? Dare the Saudis risk this? He certainly did not anticipate what happened to him. Indeed, Hariri had scheduled meetings in Beirut on the following Monday – with the IMF, the World Bank and a series of discussions on water quality improvement; not exactly the action of a man who planned to resign his premiership. However, the words he read out – scripted for him – are entirely in line with the speeches of Crown Prince Mohamed bin Salman and with the insane President of the United States who speaks of Iran with the same anger, as does the American Defence Secretary. Of course, the real story is just what is going on in Saudi Arabia itself, for the crown prince has broken forever the great compromise that exists in the kingdom: between the royal family and the clergy, and between the tribes. This was always the bedrock upon which the country stood or fell. And Mohamed bin Salman has now broken this apart. He is liquidating his enemies – the arrests, needless to say, are supposedly part of an “anti-corruption drive”, a device which Arab dictators have always used when destroying their political opponents. There will be no complaints from Washington or London, whose desire to share in the divvying up of Saudi Aramco (another of the crown prince’s projects) will smother any thoughts of protest or warning. And given the smarmy reporting of the Crown Prince’s recent speeches in the New York Times, I have my suspicions that even this elderly journalistic organ will be comparatively unworried by the Saudi coup d’etat. For that is what it is. He unseated the interior minister earlier this year and now Mohamed bin Salman is getting rid of his opponents’ financial power. But ruthless men can also be humble. Hariri was allowed to see the King – the original reason for which he believed he was travelling to Riyadh – and even paid a visit to the crown prince of the United Arab Emirates this week, an ally-nation of the Saudis who would prevent him jumping on a flight to Beirut. But why on earth would Hariri want to go to the Emirates? To prove that he was still free to travel when he cannot even return to the country which he is supposed to be ruling? Lebanon is always going through the greatest crisis since its last greatest crisis. But this time, it’s for real.